I worship this thiruvAimozhi which is nectarean for the devotees (of srIman nArAyaNan), which pleases everyone, which can bestow all benedictions, which is equivalent to 1000s of branches of upanishadhs, which is filled with nammAzhwAr‘s divine words and which is an ocean of dhrAvida (thamizh) vEdham. sarvArththadham – Starting with “mikka iRai nilai” (true nature of supreme lord, etc., which is part of arththa panchakam – the essential 5 principles) upto “mikka vEdhiyar vEdhaththin utporuL niRkappAdi en nenjuL niRuththinAn” (kaNNinuN chiRuth thAmbu 9 – nammAzhwAr establishes the ultimate essence of vEdham in my heart), thiruvAimozhi covers all essential principles. sahasra sAkOpanishath samAgamam – sahasra sAkA – 1000 sAkAs of sAma vEdham. upanishath – chAndhOgya upanishath which is the essence of sAma vEdham. udhgItham which is the essence of chAndhOgya upanishath. srI satakOpa vAngmayam – As nammAzhwAr himself said in many places as “kurukUrch chatakOpan sol” (AzhwArthirunagari nammAzhwAr‘s words). dhrAvida vEdha sAgaram viswajanAnumOdhanam – thiruvAimozhi is compared to an ocean as ocean is liked by everyone. bhakthas in this world, nithyasUris and mukthAthmAs and bhagavAn himself – everyone likes this prabandham so much. thiruvAimozhi and srI rAmAyaNam are beautifully compared and it is established that both the literature ultimately helps in freeing oneself from this samsAram to ascend to paramapadham for eternal kainkaryam and bliss. nenjE! – Oh my mind! Oh my mind! Contemplate with clarity on the lotus feet of nammAzhwAr, the one who brought out (the meanings of) the rare/difficult vEdhams in his thiruvAimozhi in anthAdhi format (ending of one pAsuram as the beginning of the next) while meditating on the sacred, beautiful land of AzhwArthirunagari which is known as thiruvazhudhi nAdu and thirukkurukUr and the most enjoyable/beautiful thAmirabaraNi river. As said in “gurupAdhAmbujam dhyAyEth” (meditate on the lotus feet of the AchArya), nAthamunigaL meditates on the lotus feet of nammAzhwAr with full focus. In vEdham, srIvaikuNtam is explained as the main land and the town on the banks of river virajA. Also, srIman nArAyaNan‘s lotus feet is greatly glorified in upanishaths as in “vishNO: padhE paramE madhva uthsa:“, “thadhvishNO: paramam padham“, etc (vishNu sUktham). Similarly, in thiruvAimozhi, nammAzhwAr too glorified AzhwArthirungari which is the residence of emperumAn who is the full focus of vEdham and thAmirabharaNi river in thiruvAimozhi 4.10.1 – “thirukkurukUrathanuL ninRa AdhippirAn” (AdhinAthan emperumAn who is firmly situated in AzhwArthirunagari), thiruvAimozhi 6.1.10 “thERu nIrppampai vadapAlai thiruvaNvaNdUr” (thiruvaNvaNdUr which is on the banks of pampA river which has pristine waters) and thiruvAimozhi 7.2.6 “thaNpunalsUzh thiruvarangaththuLLAy” (lying down in srIrangam which is surrounded by cool waters of cauvery river). Similarly, nAthamunigaL also highlights AzhwArthirunagari dhivya dhEsam, thAmirabharaNi river and nammAzhwAr‘s lotus feet because we are focussed on the essence of vEdham which is to focus on nammAzhwAr who is the purest devotee of emperumAn. I will not worship with my mind/words those who are not part of the clan who serve/like AzhwArthirunagari as I am not limited by wealth in any sense because my master nammAzhwAr‘s lotus feet are our refuge. In the previous thaniyans, the principle of worshipping nammAzhwAr is explained. In this thaniyan avoidance of others is emphasised. nammAzhwAr himself says in thiruviruththam 100 “nallAr navil kurukUr” (AzhwArthirunagari where good persons live). These are the ones who have attachment towards nammAzhwAr and thiruvAimozhi. dhanaththAlum Ethum kuRaivilEn – The reason for not supporting others is explained. For those who fully took shelter of the lotus feet of nammAzhwAr as said in sthOthra rathnam 30 “dhanam madhIyam thava pAdha pankajam” (Your lotus feet are my only wealth), everything essential is already there. So, no need to go behind others in need of anything. 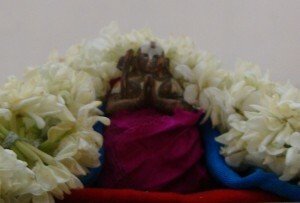 I am worshipping the most qualified lotus feet of emperumAnAr who has the most fitting glorious qualities to acquire a mind/heart that has no interest in anything other than thiruvAimozhi to behold that beautiful thamizh vEdham that was blessed (spoken) by nammAzhwAr who is filled with the best qualities without the mixing of any defects. nammAzhwAr is glorified as the most distinct devotee of emperumAn, being filled with most auspicious qualities and is complete in all manner. Since emperumAnAr is glorified in rAmAnusa nURRanthAdhi 1 as “mARan adi paNinthu uynthavan” (one who became great by surrendering unto nammAzhwAr‘s lotus feet), he is most devoted to nammAzhwAr and an expert in thiruvAimozhi and other dhivya prabandhams. Such emperumAnAr is worshipped with great devotion to be bestowed with a pristine mind to learn thiruvAimozhi and its meanings. As the AchArya is the one who dispels our ignorance and bestows us a clear mind to learn this highest knowledge, we pray to emperumAnAr to do the same. nammAzhwAr is the first mother who conceived/delivered thiruvAimozhi and the agile emperumAnAr is the well-wishing foster mother to thiruvAimozhi (1000 pAsurams) which is celebrated as thamizh vEdham and which is sung on the most auspicious qualities of periya perumAL whos is lying down in srIrangam which is covered with the seven layers forts and groves that have trees that reach the sky. In this thaniyan, it is established that all of thiruvAimozhi is sung on srIranganAthan only. nammAzhwAr himself says in thiruvAimozhi 7.2.11 “mugilvaNNan adimEl sonna sol mAlai Ayiram” (this garland of 1000 pAsurams sung on mugilvaNNan – this padhigam is dedicated for srIranganAthan who is hailed as mugilvaNNan). In the beginning, middle and the end, nammAzhwAr talks about “nArAyaNan” – periya perumAL is glorified (and originally named when being worshipped by srI rAma in ikshvAku dynasty) as nArAyaNan. Just like all of vEdham is focussed on srIman nArAyaNan, all of thiruvAimozhi is focussed on srIranganAthan. (Note: But different decads are still dedicated to different archAvathAra emperumAns, since it is the same emperumAn who is present in dhivya dhEsams). piLLai lOkam jIyar establishes by relating the 10 main qualities of emperumAn (every centum speaks elaborately about one such quality) to the 10 pAsurams in thiruvAimozhi 7.2 “kangulum pagalum” decad which is specifically dedicated for periya perumAL. In the end, he says just like nammAzhwAr is special over other AzhwArs, namperumAL is special over other archAvathAra emperumAns. Just like kaNNan emperumAn was given birth by dhEvaki pirAtti and raised by yasOdhA pirAtti, thiruvAimozhi was conceived by nammAzhwAr but then nurtured by emperumAnAr. Though dhEvaki gave birth to kaNNan emperumAn, it was yasOdha who fed him, protected him from kamsa and his demoniac assistants and nurtured him. Similarly, though nammAzhwAr sung thiruvAimozhi, he ascended to paramapadham after a short span. It was emperumAnAr who built a protective fence for thiruvAimozhi by writing srIbhAshyam to dispel the philosophies that misinterpret the meanings of vEdham, becoming full expert in thiruvAimozhi, having thirukkurukaippirAn piLLAn write the first commentary, etc – all of these to nurture thiruvAimozhi. yasOdha nurtured pramEyam (goal – emperumAn). emperumAnAr nurtured pramANam (literature – thiruvAimozhi). The leader of the residents of AzhwArthirunagari – nammAzhwAr. His thiruvAimozhi which sounds like the sweet tunes of vINA speaks about the most important 5 principles – the true nature of the supreme lord srIman nArAyaNan (parmaAthma svarUpam), the true nature of the eternal jIvAthmA (jIvAthma svarUpam), the true nature of the most fitting means (upAya svarUpam), the true nature of the hurdles which are in the form of infinite karma (virOdhi svarUpam), the true nature of the ultimate goal (upEya svarUpam). As said in “prApyasya brahmaNO rUpam … munayascha mAthmana: vEdha vEdhArththavEdhina: vadhanthi” (the essential 5 principles are spoken by sages, mahAthmAs, etc), satakOpa muni spoke those 5 essential principles (arththa panchakam) in an elaborate manner in thiruvAimozhi. Since, it is compared to sAma vEdham, this dhivya prabandham is very melodious to hear and is always sung with music. All of these are explained in AchArya hrudhayam by azhagiya maNavALap perumAL nAyanAr in great detail. mikka iRai nilai – As explained in nArAyaNa sUktham “thathvam nArAyaNa: para:” (srIman nArAyaNa – the supreme entity), etc., and in many pAsurams in thiruvAimozhi and other dhivya prabandhams, srIman nArAyaNan is the supreme lord. As thirumazhisai AzhwAr says in nAnmugan thiruvanthAdhi 53 “thiruvillAth thEvaraith thEREnmin thEvu” (I will not consider any one other than srIman nArAyaNan as worshippable), srI mahAlakshmi is also considered as important identity for bhagavAn. That too archAvathAra emperumAn – who is the most approachable form, is established as the ultimate goal. meyyAm uyir nilai – jIvAthmA is that which is different from matter, being filled with gyAnam (knowledge) and Anandham (bliss), eternal and fully dependent on bhagavAn just like the body is dependent on the soul. sarIra (body) – sarIri (soul) bhAvam (relationship) is also explained in detail as in “yasya AthmA saIram” (AthmA is body of paramAthmA), thiruvAimozhi 1.2.4 “uLLathum … avanuru” (AthmA is his body/form). The svarUpa yAthAthmyam (essence of jIvAthmA‘s nature) is to reach the stage of being totally dependent on thadhIya (devotees of bhagavAn). thakka neRi – It is the responsibility of the AthmA to protect the body. So, bhagavAn being the parmAthmA is the ultimate upAyam (means) for ones upliftment as he himself says in gIthA 18.66 “mAsucha:” (do not worry). And when we understand that we are totally subservient to thadhIyas (devotees), they themselvse are the means to uplift us as well – this is upAya yAthAmyam (essence of upAyam). thadaiyAgith thokkiyalum Uzhvinai – This is the hurdle that stops us from reaching the ultimate goal of eternal kainkaryam. The karmA from unlimited births which are carried with us is the main hurdle. Body itself is also explained as main hurdle as it hides/suppresses the true nature of jIvAthmA (being fully knowledgable). virOdhi svarUpa yAthAthmyam (essence of hurdles) is ahankAram and mamakAram. These will engage oneself into serving materialistic persons (for want of wealth, etc) and also lead to bhAgavatha apachAram such as judging a srIvaishNava based on birth, etc., and will push us to lowest levels. The cruely of such apachArams (mainly bhAgavatha apachAram) is explained in thirumAlai 33 “amaravOrangam…” pAsuram, etc., in great detail. vAzhvinai – that great life of eternal kainkaryam at the lotus feet of srIman nArAyaNan in paramapadham. It is the act of pure service for bhagavAn‘s pleasure only instead of looking for self interest. Also, as explained in thiruvAimozhi 10.9.11 “anthamil pErinbaththu adiyarOdu irunthamai” (being in unlimited bliss amidst great devotees of emperumAn in paramapadham) is considered as the ultimate goal as well. This entry was posted in thiruvAimozhi on March 8, 2015 by Sarathy Thothathri. Thanks a lot for highlighting the typo. Its fixed now.